Often the garments required to copy Guardian fashion shoots are fairly ubiquitous: white shirt, black jeans, blue dress etc. Every now and then, however, you get an awkward one. Today’s red jacket is one such garment. Since I have no red jackets, it was never going to be easy to copy the key part of the outfit. Hang on a minute, why didn’t I wear my brown one? Oh well – I forgot I had it. Since my grey jeans now have an imprudently positioned tear in the denim, and since I’m not allowed to wear heels, and since I don’t have a tanned washboard stomach, and since I don’t have a bob, and since I’m not a model, today’s outfit is boundlessly inaccurate. These new toilet shots make me look like a middle-aged version of a Bratz doll, with an enormous head and tiny little peg feet stuck at the bottom. That’s because the toilet area is quite small and Photographe Flavie (no typo, for she is French) has to climb on to the loo to get all of me in. In fact my feet often do look tiny, even though I have size-seven feet, and that is because I am not exactly spindle-shanked , to put it euphemistically, and also because I wear a lot of minuscule little plimsolls. I wear them because they are cheap and available in many good colours. But they are cold, unflattering, overly ubiquitous and in fact the colours aren’t that good. But this blog is not about the pros and cons of my plimsoll collection. Or about the variant spellings of plimsoll, which might be a better, although less ample, subject for a blog. Can you tell I don’t have much to say today? Rubbish outfit. Have untied knot for work purposes and put my jacket on properly. You don’t need to ask why. Today is payday and we’re going out for after-work cocktails. I have to go in a stained Pokémon t-shirt. Gutted. 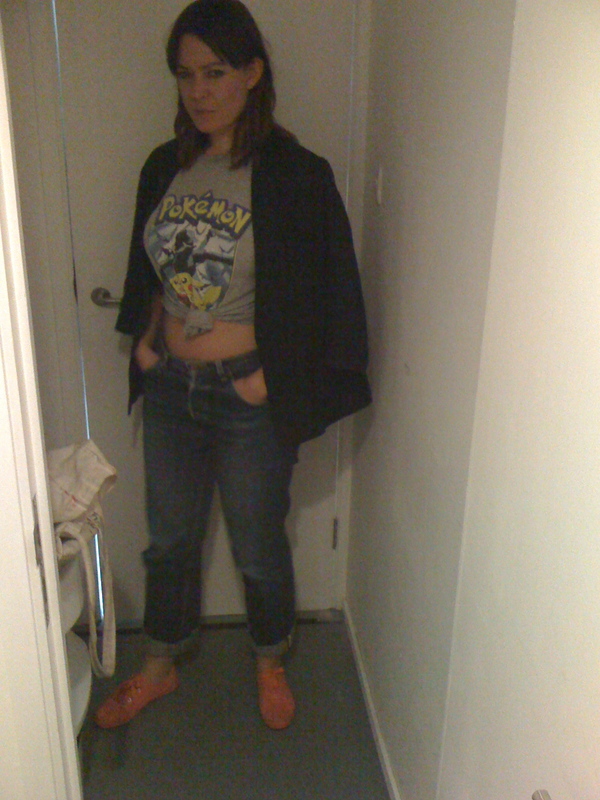 If whoever left the stained Pokémon t-shirt at my flat four years ago wants it back, just say the word. Bit of effort needed with the photo cropping. Also could do with learning some synonyms for ‘ubiquitous’. You seem to be making new friends at work – at least you’ve got a photographer. Do the others understand why you go to the loo together?? ?